When grilling on your BBQ, it is important to keep things clean as things can start to get messy, and a dirty grill can actually be quite dangerous to work with. If you grill quite regularly during the summer, you will begin to notice just how dirty your grill can become. This is when it becomes important to find a good-quality cleaning product that can help you out. 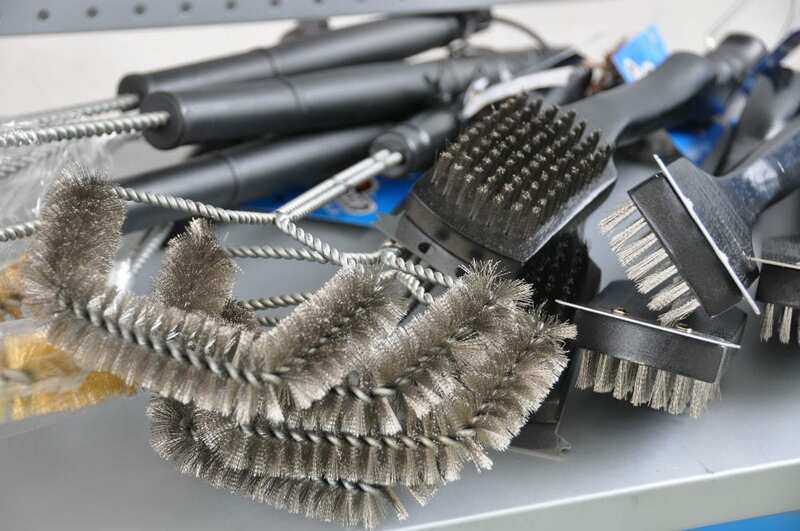 In this article, we will review 3 of the best grill brush styles for your pellet grill, so you will be able to clean your grill and make it look brand new after every session. 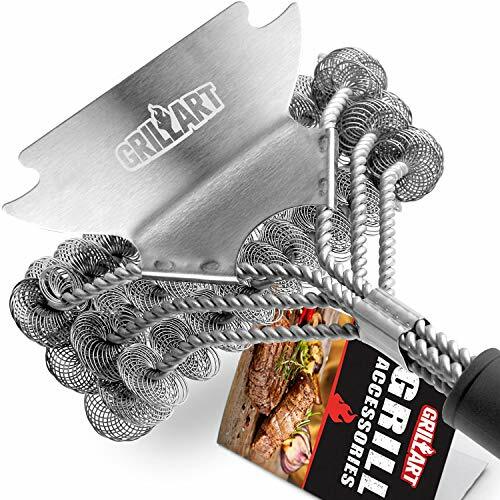 Grillart are experts in grill accessories, and their bristle-free brush is no exception. This grill brush is BBQ safe, and is very durable. We take a look at its features in a little more detail below. Grillart’s Bristle free brush is a perfect option for cleaning your BBQ. This is a safe brush which is able to reach all those hard to clean areas with ease, and even better, it’s suitable for all grill types. The Grillart cleaning brush has been designed to benefit users when cleaning their BBQ by featuring no bristles whatsoever; this means there is no chance of some bristles turning up in your food. It also makes it a joy to clean with as there is nothing falling off, making the cleaning process a whole lot easier. Thanks to a flexible and thick helix design, this grill brush can work hard. Its strong design features a metal base to remove grease, and sides which can easily clean deep between the grill bars. It features a stainless steel scraper, which is anti-rust and durable. You will be able to clean a little rougher without harming your grill. If you are looking for a cleaning product which is bound to last a good few years, without having to buy a new one then you can be guaranteed this grill brush will do the trick. This is because it features a lot more rigid triple helix, more than other brands commonly do. The next brush featured on our list is the essential brass grill brush by Grillaholics. This is a perfect brush for keeping your grill clean and one which has been triple machine tested for maximum safety. We take a look at the Grillaholics brush in more detail below. 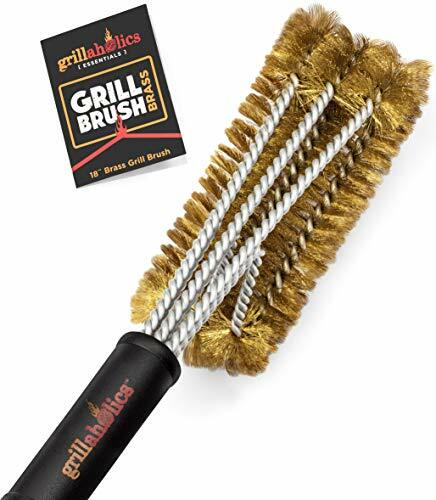 Grillaholics offer another great cleaning product with their essentials brass grill brush. This 18” brush is super durable and has a generous 5.5” brush head featuring heavy duty bristles. The essentials brass grill brush has been designed with maximum speed and efficiency in mind, and is supposed to be the equivalent of 3 traditional brushes This means you will be able to clean a lot faster and spend less time cleaning, and more time grilling. As this cleaning brush is designed with strong brass bristles, it is therefore possible to clean most grill types as these are softer and won’t scratch ceramic or porcelain grill grates. No matter what grill type you have, this special brush can clean it all with ease. If you find this brush doesn’t clean to your standards, then there is no need to worry as Grillaholics offer a 100% money-back guarantee if you are not happy. The final grill brush on our list is by Kona, and this features a 360° design meaning it can clean most areas without any issues. We take a look at this brush in more detail below. If you are looking for a good-quality grill brush which is guaranteed to get rid of grill grime, and features a long-handled brush, the Kona 360° is a good choice for you. Sometimes when cleaning with short brushes, you fear burning your hands when you turn your grill on low heat to melt the grime easier. In this case, the Kona 360° features a long 18” handle which allows for minimal cleaning effort, giving you a more enjoyable cleaning process. The Kona 360° grill brush is 60% more rigid than a conventional brush. This means it will not bend or become flimsy after continued use, so can count on it to carry out your grill cleaning time and time again. 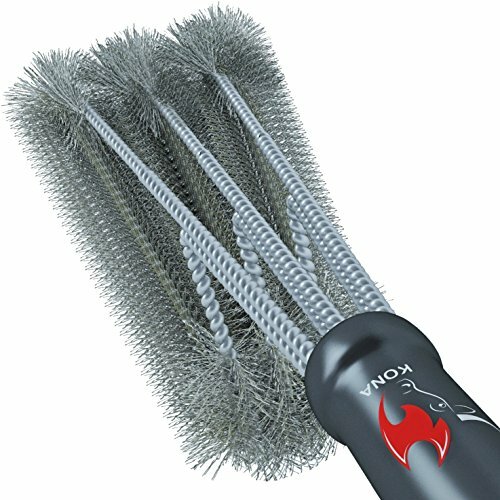 Which is the Best Grill Brush for Me? All of the grill brushes featured on our list are guaranteed to give your BBQ a good clean. If you are shopping on a budget however, then perhaps you will be more interested in purchasing a cheaper grill brush. If this sounds like you then not to worry as all of these options are suitable for those shopping on a smaller budget. The cheapest grill brush on our list is the Kona 360°. The two other grill brushes by Grillaholics and Grillart both come in at similar prices and are not too expensive. If you are looking to really give your BBQ a good clean, and clean it properly, we highly recommend any of the 3 grill brushes mentioned in our article as they will be able to clean your grill no matter how much grime is present.